At 10-6 (2-1), some might consider Georgia Tech to be the surprise of the ACC. They are a couple of free throws and layups away from being 11-5 (3-0). Coming off of an impressive win at the Carrier Dome, Josh Pastner's feisty bunch head to Clemson on Wednesday. Littlejohn Coliseum has not been friendly to Georgia Tech over the years, the last win coming in 2005. The Tigers are led by longtime coach Brad Brownell, who has a shiny new contract extension. He is 159-119 overall and 67-76 in league play during his tenure. Clemson 10-6 (0-3) came into the season with high expectations after a sweet 16 appearance in 2017-18. They eventually fell in the dance to Kansas but were impressive in the loss. Gabe Devoe and D'onte Grantham are long gone, but Marcquise Reed, Shelton Mitchell and Eli Thomas remain. Reed, an all-ACC guard is a stud both offensively and defensively, playing the passing lanes aggressively leading to easy buckets. Thomas, who suffered a foot injury in the preseason, came into the season a little out of shape but has still been effective. He is averaging a career high in points at 13.2, but his rebounding and block numbers are both down from last year. Shelton Mitchell has been the most disappointing of the trio. The historically steady guard is posting lower than expected numbers across the board following a very productive junior campaign. In conference play so far he's averaged just 7.0 points and 2.0 assists in over 28 minutes per game. His 29% from deep and 24% overall are by far career lows. While the Tigers' Kenpom number is still a respectable 47, their best wins are Lipscomb at home and Georgia on a neutral floor. Those are not exactly needle movers, though Lipscomb is a tournament team. The biggest difference from last year to this year can be boiled down to turnovers and shooting. Clemson's turnover rate is nearly 21%, up from 17.5% last year, ranking 269th in the nation. Last season, the Tigers shot 36.6% from deep; this year only 30.6%. If you look at individual match-ups, you would give Clemson the edge all day. Reed, Thomas and Mitchell are household names to any ACC fan who pays attention, but the on-court performance hasn't quite been there this year. Combine that with the fact that Brad Brownell never knows what he will get out of sophomore forward Aamir Simms and it is difficult to trust the Tigers regardless of venue. In their three conference losses this year they have averaged a dreadful 54.7 ppg. I'm going with the good guys here. Georgia Tech is long past due to get a win at Littlejohn. 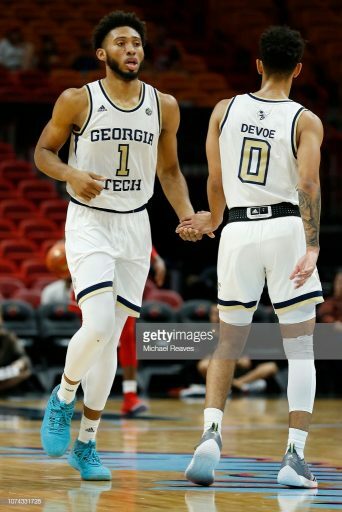 Jose Alvarado and Mike Devoe have been very good lately outside of Devoe's shooting woes. Coach Pastner shortened the rotation against Syracuse and the results were impressive. Trusting a Tech team on the road is always shaky, especially after they just landed a big road win, but I like our coaching and I like our guards. Keep the rotation short, don't let Reed take over the game and we get out of town with a W.
Poor Moses Wright actually scored 4 buckets, but all of them were in close to the basket. Dude went 0-2 from 3 and 1-4 on free throws. It scares the life out of me when he dribbles the ball. If he could figure out his strengths and weakness and the coaches could figure a way to use him close to the basket on offense, he could be a valuable contributor. CuseJacket, SecretAgentBuzz, gt69hjcollins and 5 others like this. msargent1, HurricaneJacket, OG-T and 2 others like this. One thing I did like last night was Khalid. We were down 14-2 or whatever and he just got the ball and put his head down and went to the hoop. He was determined to get us points one way or the other. He did the same in the second half and had a nice drive to the hoop. GTJason, gte447f, THWG and 1 other person like this. Clemson is a capable team and they played well on offense and defense. They also looked prepared to me. For sure.. we knew that they were going to be prepared and play hard, but I didn't expect them to be so sharp offensively. It didn't help that we came out super flat as I had feared. Kudos to the guys for waking up and making a run, but we came out with another slow start in the second half. Clemson made their 3's in the second half and kept the lead stretched. That was that... Let's rebound with a big effort on Saturday. Bogey404, gt69hjcollins, msargent1 and 1 other person like this. While I also want the coaches to figure out a way to use him close to the basket, why don't they simply start by not letting him shoot jumpers? This is one thing that screams "coaching" that I just don't understand. He can continue to work on the distance part of his game in practice. For now, there is nothing in many minutes of game tape that suggests he should be playing at 18-21 feet. sidewalkGTfan, Peacone36 and lauraee like this. Hope he gets a big birthday win @ LJ! Go Jackets! msargent1, gtpi and MidtownJacket like this. I just got in at +8.5, feeling pretty good about that. Hopefully we can overcome the LJ curse, as others have said we are definitely overdue. “Hopefully”? Screw that. We’re going to be rude guests. Don’t invite us unless you want a beat down. Bad day to be a Tiger. GTRhino24, gtpi and MiracleWhips like this. I think we can take relentless defense as a given at this point. If we do nothing else we defend and make shooting tough. I think the real key to winning is just having guys be confident and pull the trigger. Even against 'Cuse I saw a few times where I was thinking "shoot it that's you" and then there'd be an extra pass. If we can have Haywood shoot well, and Alvarado hit his open 3's, it just opens up the floor so much for everyone else. Haywood should keep working on his handle cause man he sees the floor so well and passes really well. Nice to have an extra distributor. gt69hjcollins, lauraee and dtm1997 like this. Most of his 3s, and he doesn't have many long 2 attempts, have been at the end of shot clocks. You can't just not shoot in those situations. I mean you can, and we have had people that refused to, but it's not the right move. That's fair, I'll give a little. Still, while I recognize you said majority, that leaves some of his 15 attempts this year that shouldn't have happened. Perhaps my reflex is simply PTSD from an entire year (last year) where the issue was not addressed. That was coaching. I think he's a microcosm of the way the game has went. Everyone wants to be a stretch and chunking 3's and hard to find the guys that will do the dirty work down low. Hell, the Rockets shot 70 3's last night. 70. Duke shot like 50 the other night. To me as a basketball purist that is just not really the game I grew up loving and playing anymore. GT_EE78 and gte447f like this.